Visitors flocked to the spectacular 1940s event that was held at the Lincolnshire Wolds Railway on 11th and 12th September. 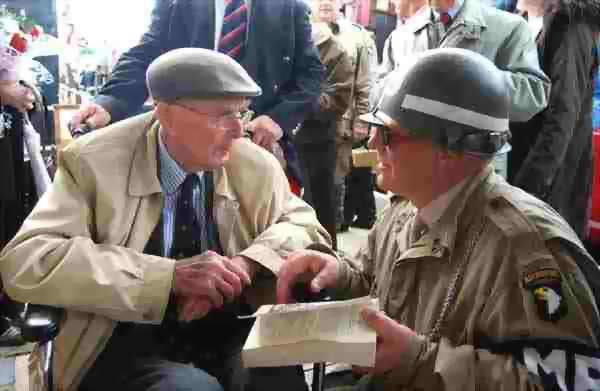 The first train on Saturday carried 'evacuee' children from North Thoresby Primary School to Ludborough station, accompanied by Battle of Britain Hurricane fighter pilot Squadron Leader Douglas Nicholls DFC, who officially opened the event. "In the year when we commemorate the 70th Anniversary of the Battle of Britain, it was a privilege to have Douglas Nicholls, one of 'The Few', as our guest of honour", said LWR spokesman Gordon Newton. "The 1940s Weekend is one of the most popular attractions in the railway's calendar and being held in conjunction with the neighbouring villages of North Thoresby and Fulstow, it has evolved into a real community event", said Gordon. "A special mention must go to members of the Northern Forties, The Airborne Eagles (American re-enactors) and The Wind Hund (German Re-enactors) who all put on a great show. The attendance on both days was tremendous, with many visitors adding to the atmosphere by coming dressed in 1940s style". There was something for all the family - vintage vehicles, music, craft stalls, a life-size mock up of a Spitfire, '40s re-enactment groups and much more. Steam Trains ran between Ludborough and North Thoresby throughout the weekend, with extra services to cope with the number of passengers. Based at Ludborough, the steam railway operates on a stretch of line that used to be part of the Great Northern route from Boston to Grimsby. The line sadly closed to passengers in 1970, along with many other lines in East Lincolnshire, but the section between Grimsby and Louth was fortunately retained for freight trains for a further ten years. Following closure, a preservation society was formed and set about restoring the line. Gradually through perseverance and dogged determination the infrastructure was put back in place. Locos and rolling stock were acquired and restored to working order. 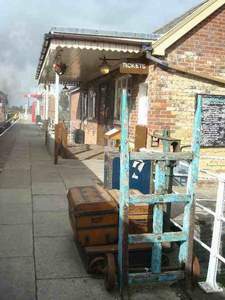 What visitors at the railway see today is a result of all the time and effort that a dedicated group of volunteers have put in over the years.